Man, the Nikon Coolpix S1000pj has gone from crazy rumor to seemingly-real to whoa-here's-the-press-release in record time -- the compact cam with the integrated projector was just officially announced, along with the three other cams we saw leaked earlier today. Leaked specs for the S1000pj were dead-on: a 12.1 megapixel sensor with ISO 6400 sensitivity mounted behind a 5x wide-angle zoom lens with five-way VR stabilization, and that LED-powered projector that'll put up a 40-inch image for slideshows complete with music, effects and transitions. We're a little less excited about the $430 list price this thing will carry when it hits in September, but on the whole it's a pretty terrific idea and we're completely intrigued -- looks like we'll be saving our pennies this month. Pictures of everything in the gallery, deets on the other cams and a video of the S1000pj after the break. 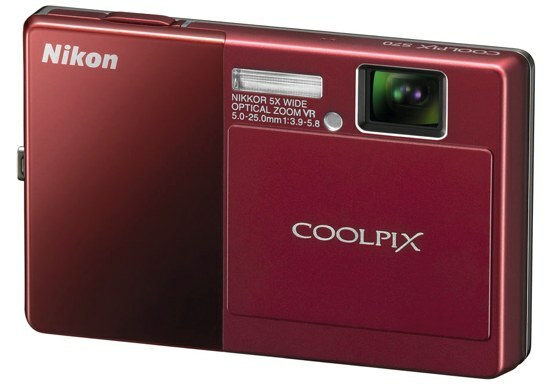 The Coolpix S70 (pictured in red) is essentially the same cam as the S1000pj, although it has an OLED touchscreen instead of the projector: 12.1 megapixels, 5x zoom with five-way VR. It'll be available in quite a few color combos this September for $400. The Coolpix S640 is focused on speed -- it offers a .7-second boot-up time and "ultra-fast" autofocus, along with a 12.2 megapixel sensor, 5x four-way VR zoom and a 2.7-inch LCD. Tons of colors, September, $250. Lastly, the the Coolpix S570 is the basic model of the group, with a 12.0 megapixel ISO 3200 sensor behind a 5x four-way VR lens and a 2.7-inch LCD. Again, tons of colors when it lands in September for $200.